Laura Díaz Muñoz. Credit: Galerie Wines. Through her solo project, Galerie Wines, Laura Díaz Muñoz offers up a series of varietal wines, two Sauvignon Blancs and two Cabernets, one apiece from Knights Valley and Napa Valley. The grapes are treated the same way, with the same amount of skin contact, same winemaking methods, same barrel regimen, which allows the wines to speak to their different origins. The Knights Valley wines come from Kellogg Vineyard, while the Napa Sauvignon Blanc and Cabernet come from a variety of sites around Napa. Both Sauvignon Blancs were handled the same way in the cellar. Half of the grapes were whole-cluster pressed, and the juice was then racked into a mix of concrete eggs, stainless steel, new and used French oak. The wine was aged on the lees for six months, with stirring done twice a week. Both Cabernets are 100% Cab are aged 19 months in 55% new French oak. Laura is no newb to these grape varieties. After studying food science as an undergraduate and receiving a graduate degree in oenology from Polytechnic University in Madrid, she worked in Sauvignon Blanc hotbeds of New Zealand and Chile. Laura then joined up with Chris Carpenter, (who produces some incredible Napa Cabernets under the Cardinale, La Jota and Mt. 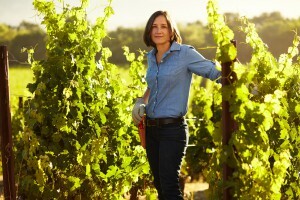 Brave labels) and became the assistant winemaker. At a dinner with Laura last year, she told me she’d never been to California before accepting the gig with Chris. But she fell in love with Napa, and stuck around, though she travels back to Spain frequently to visit her family. After working with Chris, Laura said she wanted a project that was fully her own, a wine label that would bare her unique signature. Laura says she and Chris share a similar winemaking philosophy. They both use wild fermentation and Galerie uses the same coopers as Chris, but Laura says she prefers a bit less oak and brighter red fruits in her wines (a preference that rings true in her Cabernets). While Galerie’s focus is on Cab Sauv and Sauv Blanc, in 2014 Laura crafted one heck of a Riesling. The Spring Mountain Riesling was the first time she’s worked with this grape, but said she was thrilled about the prospect. Spring Mountain seems to produce some really high quality Riesling, and this one stunned me. (Smith-Madrone comes to mind as another example). The fruit comes from a very small plot (less than two acres), so there’s not much to go around. The wine is slightly off-dry, but the intense acid needs a slight bit of sweetness to tame it (and Laura maintains it helps lift the aromatics as well). Taken together, these five wines comprise quite an impressive portfolio. Major league quality, but AA league prices. These wines were received as trade samples and tasted sighted. A bright, crisp appeal on the nose, with complex floral perfume and white pepper on top of sliced green apples and tangerines. Crisp and crunchy palate but some creaminess adds texture and depth to the wine. Orange peel, green apples, green pears, the fruit is crisp but ripe, and matched with hints of chalk, crushed rocks, sea spray, raw almond and a hint of white pepper. Long, lingering finish with a sense of pure minerality, this is a vibrant and exciting Sauvignon Blanc. Lovely floral, green apple, lime and sea salt notes on the nose. On the palate, this has a creamy presence but precision comes from pure, clean acidity. Fresh green apples and limes mix with papaya, and the fruit is laced with notes of sea salt, river rocks, minerals, dried white flowers. Hints of waxy, honeyed notes, but this is a bright and refreshing wine with a lot of complexity. Lots of seemingly contradictory elements to ponder, but the whole is so balanced and integrated. Aromatically firing, this is bold but elegant with bright honeysuckle, lilies, salty air and cucumber water on top of sliced limes and nectarines. Crisp and edgy on the palate but some very moderate sweetness to balance out the bright acid. This is a precise but exuberant Riesling with complex flavors of crunchy green apples, nectarine, pears and peaches. I also get crusty sea salt, honeysuckle, sliced cucumber and minerals, there is a whole lot going on with this Riesling. I’m very interested to see how this wine will age, but this is beautiful right out of the bottle. Deep purple color. Nose of tart blueberries and rich currants, the fruit is smooth and ripe but bright at the same time, and laced with sweet spice, pepper, loamy soil, coffee and cola. This is a young, bold wine with sturdy but velvety tannins, some moderate acid keeps if refreshing, though. Blackberries, blueberries, black currants, a rich wine but it maintains a slice of tartness. Mixed in with complex elements of graphite, mocha, loam, roasted chestnut, black licorice and charcoal. Complex, young, needs time but this is gorgeous even at this young age. All Cabernet, aged 19 months in 55% new French oak. Great stuff. One of the best Cali Cabs I can remember in this price range. Rich purple color. Dark and saucy on the nose, the blackberry and currant fruit is rich but suave, and I get complex elements of violets, sarsaparilla, birch bark and rocky soil. A whole lot to unwrap on the nose. Bold presence on the palate but also quite silky; the tannins are smooth and fine and the medium acid keeps it all moving forward. Fresh currant, black cherry and plum skin mixes with violets, loamy soil, fallen leaves, eucalyptus, cedar, hints of peppery spice. A lot going on here, but the wine stays open and inviting in spite of its richness and youthful complexity. I’d love to lay this down for five to eight years, but it’s a beauty.